Pat Bagley picks up on a theme I've mentioned here a few times recently, which is that the spread of hostility and division began with the advent of talk radio when the FCC ended the Fairness Doctrine. A decade or so later, the Internet became user-friendly and ubiquitous enough that haters and borderline psychopaths could find each other and make common cause, but it was talk radio that first turned pathological extremism into a booming business, and made it socially acceptable to say things in public that, up until then, a sense of common decency repressed. I don't know how you get that toothpaste back into the tube, and the fact that sociopaths no longer need Rush's radio show as a gathering point only makes things worse. And it's an equal opportunity phenomenon: Social Justice Warriors in Portland ganged up on-line to drive a pair of burrito vendors out of business because it's "cultural appropriation" for gabachas to make Mexican food (no word on whether they're also targeting non-Italian pizzerias), while, across town, a warrior from the other end of the political scale built his cred as a Social Injustice Warrior on Facebook and then slashed the throats of two people who objected to his insulting a Muslim woman. As I write this, a large contingent of cartoonists are in Portland for the NCS convention and I hope they all behave themselves, because it sure seems like the folks who live there are a little overly reactive. Though, to repeat a paraphrase from the other day, you don't have to go to Portland, because Portland will come to you. I'm not sure whether the issue is that the Internet gives hatemongers a place to gather or that it just allows for the public airing of opinions that previously would have been too obnoxious for anyone to repeat in decent company, but that may be a difference without a distinction. In any case, hate got its first toehold on talk radio, because the FCC decided that the government-owned airwaves were no longer something to be administered for the public good. Now the FCC is on the verge of dropping a requirement that licensed broadcasters maintain an actual studio in their city of license. To quote from this trade magazine, "FCC chairman Ajit Pai said the rule was outdated because in the digital age the community has access and can engage with stations via social media or email without having a physical studio nearby." In practical terms, that means large chains can simply upload their programming without any need to actually "serve" the local community, and, coupled with the FCC's decision to abandon the block on cross-ownership, a corporate chain can now own all the media in a community and give the public whatever they feel the public needs to hear, see and read, while protecting people from hearing, seeing or reading any information the company disagrees with. But you can email the station to ask why they don't cover your community, and they'll email you back thanking you for your comment. The Internet giveth, and the Internet taketh away, with help from the FCC. Jeff Danziger on yet another example of Trump making empty promises to a trusting booboisie. Deporting foreigners to save American jobs is simply one more lie to workers. On a related sour note, a Trump advisor declared the other day that coal is not a practical product anymore, while the Trump budget cuts funding to help ex-miners develop other income. To be fair, cutting down on undocumented farmworkers would be a good thing, since many who work under the counter are truly exploited and deserve better. But we should differentiate between them and those who accept workplace abuse in cruddy jobs out of fear of being deported, and who have taxes withheld for benefits they daren't claim. That, however, is a fine point in Danziger's overall statement that our food industry relies on foreign workers. Again, we're dealing with newspeak from Dear Leader, whose Mar-A-Lago resort uses foreign workers through legal visa programs. Even at the wages required by those programs, you can't find American workers who will take the jobs. There may be fewer under-the-counter workers, but that doesn't mean Yanks are getting, or even want, the legitimatized jobs. 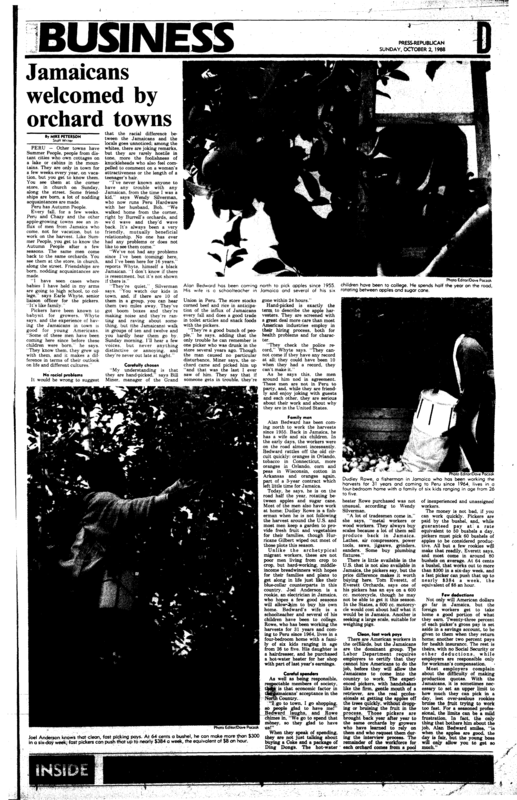 When I covered business in Northern New York, I wrote several times about the Jamaicans who come back to Peru, NY, year after year to pick applies under the H2-A visa program, which dictates pay rates and requires that apple growers advertise jobs locally and give Americans preference in hiring. There can be, and are, abuses in any program, but the pickers I met over the years were content with the work, coming back year after year to the same orchards, and lived very well on their earnings. For Jamaicans, it's good work. And Americans don't want those jobs. Back in the 1940s and 50s, college students in Northern New York went out to the orchards en masse to help with the harvest, while, when I was an editor in Maine, Sen. Susan Collins told me of her days as a schoolgirl in Aroostook County, when they would have days off to go as a group and work the potato harvest there. You can find much more on the topic in this substantial article from Modern Farmer, which I highly recommend, and which notes, among other things, that localvores and organic consumers are not faultless in this. It also points out that Americans pay far less of their income proportionally for food than do consumers in other countries. Here's a second source on that. And a chart from yet a third. There's a popular bumpersticker that says you shouldn't complain about farmers with your mouth full. Well, certainly not with a full mouth and a full wallet.